What do we do about the Senate? Whether it’s fighting inequality or fighting climate change, no good idea seems to make it out of the body intact. Never fear: my new report for Roosevelt Institute has a plan. Many plans! The problem: The Senate’s apportionment of two seats per state regardless of population size is one of American government’s sharpest breaks with the fundamental democratic principle of one person, one vote. The individual Wyomingite has 67 times as much power as a Californian. 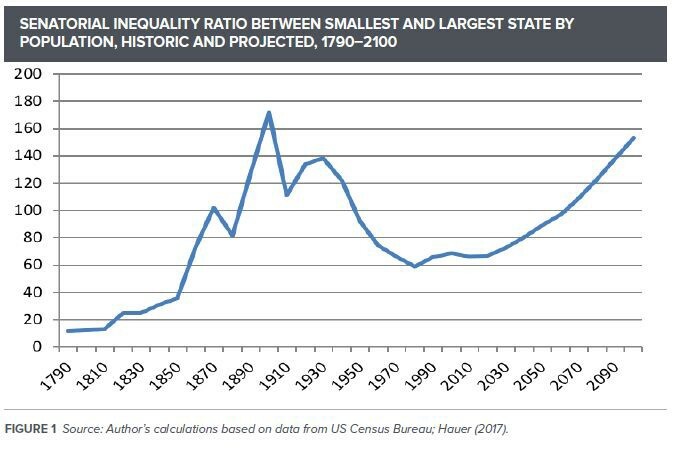 The outsize power of people in small states has gotten worse since the Constitutional Convention. And it’s slated to get doubly bad in the coming decades — just when we need bold responses to existential threats. The US is an outlier. No other advanced democracy’s senatorial inequalities are this large. Countries like Denmark and New Zealand only have single population-based chambers. The UK and Canada have non-democratically selected second chambers, but they’re nowhere near as powerful as the US Senate. And Australia, which is closest to our system, has a senatorial inequality of 13 to 1. Compare that to our 67 to 1 ratio, and it’s nowhere close. But the violation of the principle of one-person, one-vote is not the only problem with the Senate. Our report shows that Senate apportionment reinforces white, rich, rural, male rule… and will do so long after the US becomes a majority non-white country. With current projections, the US will be majority non-white by 2050, but white majority small states will continue to have a veto over important legislation through 2100. This structure affects who is represented and how: white men are 30 percent of the population but 71 percent of the current Senate and 96 percent of all historic senators. This tiny representation by everyone else affects policy priorities, as a wealth of research by John D. Grifffin, Kristina Miler, Nolan McCarhty, and Nicholas Carnes shows. So what to do about it? We’ve got ideas. Some you’ve heard. Steven S. Smith has called for fundamental filibuster reform — which allows a single senator to block progress. In his proposal, the cloture threshold would be lowered every day debate drags on. David Faris has urged California to split into 7 new states to fix that state’s underrepresentation. And recently passed former Dean of the House John Dingell (D-Mich.) called for abolishing the Senate altogether. Our report develops an idea that has gotten less attention: grant dedicated Senate representation to non-states, including DC, overseas territories, and Native Americans. This would add eight new senators — likely to be non-white. This would diversify the Senate and move up the end of white minority rule by several decades. Here’s @kendrabozarth on Why This Matters. No other advanced democracy denies representation to its federal district and overseas territories. In the US, this means that nearly 5 million people in American Samoa, DC, Guam, Northern Mariana Islannds, Puerto Rico, & US Virgin Islands are left out. Parts of this idea are already moving. Earlier this month, the House passed HR 1, pledging to give DC a vote in Congress. Sen. Mitch McConnell pledged to kill the idea dead — reinforcing our analysis above of the Senate’s democracy deficit. Our Full Representation proposal — linked or not to DC statehood — could be one way to break through the logjam. Giving representation to all disenfranchised people offers a principled and universal basis for moving forward. The other plank of the proposal — dedicated Senate representation for Native Americans — also takes up a largely forgotten part of history. The US’ treaties with the Cherokee and Choctaw nations pledged representation. @tahtone @EzraRosser have more. Ironically, only the racist Confederate States of America made good on this promise. Not good enough. States like Maine and countries like New Zealand already give dedicated representation to indigenous people — it can be done. If you are interested in these issues, some great resources include @DCVote, @NCAIPRC, and @EquallyAmerican, an organization that works to advance equality and civil rights for Americans living in US territories. Exciting new work is also emerging on filibuster reform. Plug in! In sum, while liberals have often clung to counter-majoritarianism as a safeguard, the nation will look very different in the decades ahead. We need political structures that reflect our multiracial democracy so that we can tackle existential threats.